Sweet Itch is an allergic reaction and therefore an immune system problem. Unfortunately these are notoriously complicated and difficult to deal with. The disease is a delayed hypersensitivity to insect bites and results from an over-vigorous response by the animal’s immune system. 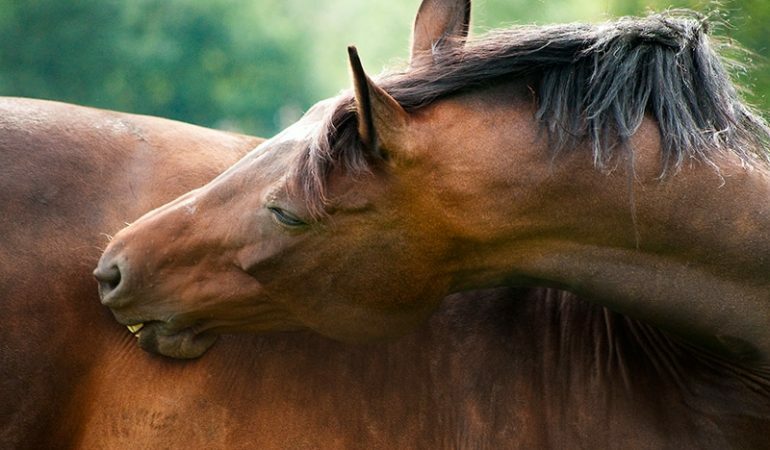 In the process of repelling invading insect saliva (which actually contains harmless protein) the horse attacks some of its own skin cells ‘by mistake’ and the resulting cell damage causes the symptoms described as Sweet Itch. In the UK several species (of the 1,000 or so that exist) of the Culicoides midge and, to a lesser extent, the larger, hump-backed Simulium Equinum, a member of the blackfly family, are responsible. Each has a preferred feeding site; Culicoides tend to be body feeders and the Simulium earfeeders. Culicoides adults mainly rest among herbage and are most active in twilight, calm conditions. Breeding sites are commonly in wet soil or moist, decaying vegetation. They are tiny, with a wing length less than 2 mm and able to fly only a short distance (100 metres or so). Male Culicoides are nectar feeders, but soon after hatching the females mate and require a blood meal to mature their eggs. They do not fly in strong wind, heavy rain or bright, clear sunshine. They dislike hot, dry conditions. The grey light at dusk and dawn suits them well, and they are at their most active at these times. However, as they are poor fliers, if there is too strong a wind, or rain during early morning they will simply wait until later to feed. Likewise they may feed at any time during humid days with cloud cover. Culicoides are on the wing and breeding from as early as late March until the end of October, depending on geographical location. There is only a short breeding season each year in the north of Scotland, while in the south of England larvae will hatch throughout the spring, summer and autumn, depending on weather conditions. Seasonal variations in the weather can have an impact – recent winters have been milder and damper allowing breeding to start earlier. Summers that are alternately sunny and rainy cause an increase in midge breeding habitats and therefore an increase in the numbers of midges that are around to bite. Under these conditions most horses will show symptoms of Sweet Itch to some degree. Culicoides numbers are the critical factor. Culicoides larvae are able to survive severe frosts but they do not survive prolonged drought conditions. Research into how Culicoides locate their prey indicates that they primarily do so by sight.